I'm sure you're wondering what GIY is and I'm sure you're wondering why this isn't edible. if we're being picky, I did make it so technically it fits with the theme of my blog. as for GIY: glitter it yourself! I found this idea on pinterest. it's like the foodgawker of crafts and I LOVE it. I'm not a very crafty person but once in a while I enjoy sitting down taking my time to make something. 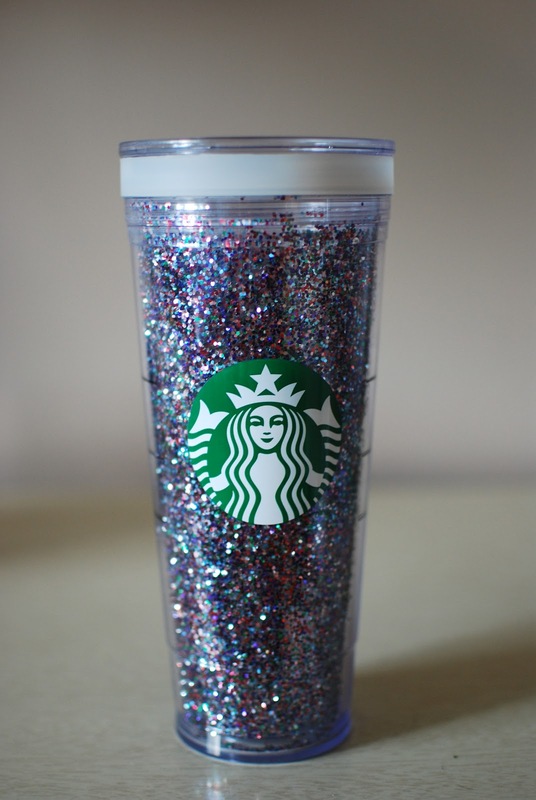 I already had the cup thanks to my sister and the second I saw the glitter idea I was sold. I ran to the store after work yesterday to pick up the supplies and commenced the crafting the moment I walked through the door. all you need are a few things: the cup (can be found at any starbucks location, mine was a gift from my sister! ), some form of adhesive, glitter and a sponge applicator brush to spread the glue. unscrew the cups and paint the inner cup with a thin layer of mod podge and then sprinkle with glitter. make sure all the areas are covered so it's not patchy. leave it out to harden and dry. put the inner cup back inside the outer cup and voila! a GIY cup that is sure to turn heads. I adore mine. it has made me want to put glitter on everything. I just went out to purchase green tea and lemonade so I can make my own version of iced green tea lemonade and enjoy it out of my bedazzled glass! summer is coming to a close and I've hardly blogged. life has been busy between working and visiting family and friends. I can't make any promises that posting will be any more or less frequent, but I'm making an effort! watch for more DIY in the future!